Without speaking a word or threatening force, a man committed grand larceny at a bank in Virginia and took off with approximately $4,000, as reported by The Roanoke Times. The man walked into the bank and slid a note to a teller. The note simply asked for $4,000 in cash without any marked bills or other countermeasures. The teller complied and handed over $3,571 in cash. Over the course of the bank theft, the man never uttered a word. He did not brandish a weapon or otherwise threaten bank staff. Those two facts were important during the criminal trial. Without any evidence of a threat of force, the prosecution was not able to convict for the crime of robbery. In order to understand why the crime of robbery did not apply to this situation, we will review the Virginia legal approach to petit larceny, grand larceny, and robbery. As outlined in Code of Virginia 18.2-96, petit larceny is a theft crime. If a thief steals money or items worth less than five dollars from another person’s possession, it is petit larceny. To illustrate, think of a pickpocket. Petit larceny also applies to the theft of items worth less than $200, but not directly from the owner’s possession. This type of larceny is more like burglars breaking into a home to steal valuables. In either case, petit larceny is a Class 1 misdemeanor. Such misdemeanors can result in fines up to $2,500 and jail time of one year. Under Code of Virginia 18.2-95, we can find the state-specific definition for grand larceny. Grand larceny involves the theft of higher-value items than petit larceny. There are three types of grand larceny. The first type of grand larceny involves the theft of more than five dollars from another person’s possession. The second type of grand larceny concerns the theft of items worth more than $200, but not directly from the owner’s possession. 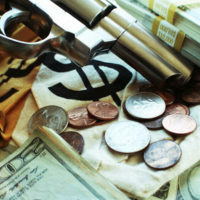 The third type of grand larceny involves the theft of any firearm, but again not directly from the owner’s possession. Grand larceny constitutes a felony in any of the cases described above. The punishment for grand larceny can include up to 20 years in jail and $2,500 in fines. As detailed in Code of Virginia 18.2-58, robbery involves a theft by violence or threat of force. The threat of force can include the display or use of a firearm during the theft. The statute is construed broadly to include most types of violence and threats. So long as the victim has a reasonable basis to fear violence, it qualifies as robbery in Virginia. Robbery is a felony in Virginia. The penalties can include a life sentence in jail, with a minimum sentence of five years. From petit larceny to grand larceny to robbery, the penalties and fines escalate sharply. To maximize your chance of success, it can be advantageous to seek out a skilled criminal defense lawyer at the office of Simms Showers LLP. Our attorneys are prepared to assist you today.